Objective: The student will be able to use ordered pairs to describe points on a coordinate grid. Students can use Scratch, a logic-based computer programming tool, to explore coordinate grids with a real-world connection. Based on their level, you can create easier or more difficult questions and tasks. Use a worksheet to guide students through the activity. What is the default location of the cat when you open a project? How does that location change when you drag the cat to other places on the screen? How can you draw lines by changing the x and/or y coordinate for the location of a sprite? How can you draw a line by changing one coordinate? How can you draw the x and y axis of the coordinate grid by using coordinate pairs? How can you use coordinate pairs to draw specific shapes, such as your initials? For more Scratch lesson plans, check out http://wiki.classroom20.com/Scratch+Lesson+Plans. You can also find Kig geometry lesson plans at https://wiki.edubuntu.org/Lessons/Kig. Objective: The student will be able to use the language of mathematics to communicate his/her math thinking coherently to peers, teachers, and others; and analyze and evaluate the math thinking and strategies of others. Blogging is clearly an amazing tool for the writing classroom. But it doesn’t have to stop there. Reading teachers can use blogs to start discussions about books read in class; science teachers can have students explain their understanding of an in-class experiment; social studies teachers can have students write letters to their congress people and post them on their blogs. Blogs are also the perfect place for students to learn to communicate their mathematical thinking. For students to progress in math, it’s extremely important for them to be able to articulate exactly how they solve word problems and why they chose this method. In addition to strengthening students’ mathematical understanding of a concept, it can point teachers to common misconceptions. Post a word problem for your students to solve. On their blogs, the students are expected to explain their thinking step-by-step (i.e.. “when I read the problem, I thought this. So I…”) – this may require some pre-teaching. As they explain their thinking, students should show their math calculations (for some students, the math calculations might be a drawing that you photograph and post on the blog). Objective: The student will be able to find the perimeter and the area of an object. First, spend one day teaching students about perimeter. The next day, introduce the idea of area. Then, take students out onto the playground. Tell them to walk on the PERIMETER of the playground (generally, students will walk in a line around the outside of the playground). Then, ask them to walk in the AREA of the playground (they run around in the middle of the playground). Keep switching your directions — having students walk along the PERIMETER, and then inside the AREA. Afterwards, discuss what students noticed — were the perimeter and area the same? Etc. Next, have students play the Cyberchase game Cyberspaceship Builder. In the game, students are given a set perimeter. Then they have to create shapes with various areas using the same perimeter. As students play, have them take notes about their findings. You might want to make a worksheet where students must demonstrate the different perimeters and areas they create. With older students, you could have them record their findings in their math notebooks. Objective: The student will be able to eliminate incorrect answers using logic and reasoning skills. Have students use the FREE Sudoku app that comes with the Nook Color to practice their logic and reasoning skills. The app allows students to pencil in notes and use a “pen” when they’re certain of an answer. If they mark something that can’t possibly be correct based on the numbers already filled in, the number turns red, which can help scaffold understanding. The app also allows users to choose their difficulty level and pause play, so students can come back to the same puzzle day after day. The app times them, so they can see how long it takes them to complete a Sudoku puzzle and track their progress as their speed improves. Objective: The student will understand the causes and effects of climate change. After learning about climate change, post an assignment on your class social network asking students to come up with a project that will help stop the climate crisis. Students can advertise their project idea however they’d like – with videos, glogs, blogs, etc. – but they must post all their advertisements on the social network. Then, the entire class will vote on which project they’d most like to undertake. As a teacher, you can decide if you want the entire class to take on the project that gets the most votes. Or you can have each student choose a single project, outside of their own, to help with and leave a comment on that post. Then, every student completes their own project, using the other students who signed up as helpers. Objective: The student will be able to communicate the results of an experiment. Throughout the school year, middle school students complete dozens of lab experiments, and they often collect unique data sets. Once you’re confident that students are able to create their own basic graphs, have them use Many Eyes. Students can type or paste their data directly into the site, assess 20 visualizations to find the one that will best communicate their findings, and create a visualization with two or more variables. Not only will the product help students communicate their findings, it may help them make discoveries about their data that they didn’t recognize earlier. Objective: The student will be able to understand and report the details of a specific scientist, animal, element, or concept. Just like you can assign each student to be a literary character or a historic figure on a social network, you can extend that idea to science. You could assign your students to be famous scientists, scientific principles, or even scientific theories. What would Evolution say to Creationism? If you’re teaching marine biology, you could assign students to be different marine animals. How would they interact with one another if they had personalities, could speak, and could access social networks? My absolute favorite idea for a science social network, though, was sparked by a video called “Chemical Party.” The video personifies chemical elements and compounds, and it got me thinking, “what would neon post on hydrogen’s wall?” Wouldn’t it be great if your chemistry students were asking this question at home on a Friday night? Objective: The student will be able to recognize the cumulative nature of scientific evidence AND perform tests, collect data, analyze data and display results. On Skype in the Classroom, post a request for a partner science class with students of the same age as yours. Depending on your scientific focus, it might be interesting to find a class in a different climate or geographic area (coastal vs. plains). Once you find a class and a teacher that meets your needs, set up a schedule of Skype calls — several in the following weeks or months. Using class lists from both classes, work with your partner teacher to create Skype buddies or groups. Have students meet their buddies on Skype — these will be their lab partners. Either have the students work together decide on their own science experiment or offer them a guided experiment. Have students communicate with their partners via Skype and each collect their own data for the experiment. Have students use Google docs (or another wiki-like tool) to collaboratively record and analyze data and create a final report or presentation. Objective: The student will be able to compare and contrast a typical day in the life of an ancient Egyptian with a day in the life of a modern-day American. A “Day in the Life” report is one of the staples of middle school social studies classes. Most of us can remember a project or paper we had to write about life in ancient Egypt or Rome or Greece. This assignment lends itself perfectly to a video report. Students can act out a typical day in their own lives and then splice in clips of what a similar act would be like in an ancient civilization. See little Johnny wake up to his alarm clock. Cut. See little Johnny, dressed as little Magdi, wake up to the sunrise in Egypt. And so on. What does Johnny wear? What does Magdi wear? What does Johnny eat? What does Magdi eat? Having to plan, film, re-film, and edit a video like this will certainly help students master the objective. Plus, the videos will likely help other students remember key concepts from the unit. Objective: The student will be able to understand and report the details of a specific historic figure, country, group, or event. 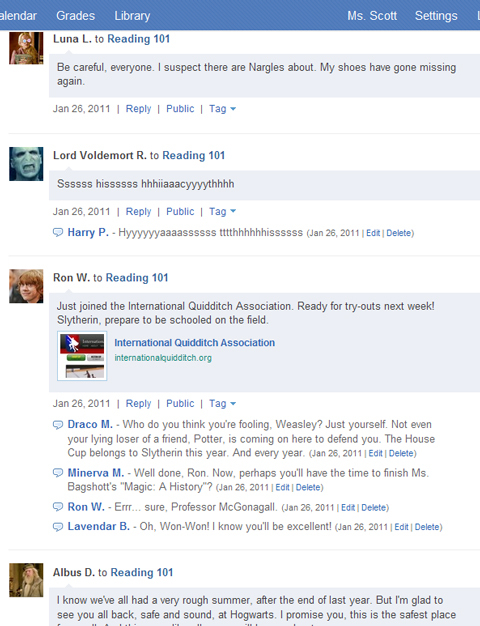 Social studies teachers have started some of the most creative social networking sites I’ve seen. It’s easy to see why — social networks can make history come alive for students, through role play. When I was a kid studying the American Revolution, our teacher assigned each of us a historic figure to research. One student got Thomas Jefferson, another was assigned Ben Franklin, and so on. We all wrote papers and made posters. Then, we stood in front of the class and talked for 5 minutes, during which only about 3 kids paid attention. With social networking, this assignment can become more interesting and much more meaningful for all students. Instead of (or in addition to) writing a report, each student could be assigned to create an Edmodo profile, posing as a historic figure (like this Thomas Jefferson profile). Then, students could be required to interact with one another as that historic figure. How would Ben Franklin respond to Thomas Jefferson’s comment about democracy? Students would have to understand a lot about their own historic figure, but they’d also have to know a good deal about other figures in order to converse with them. Deeper, higher-level thinking would be required of students, but the assignment would also be fun and motivating for them. Social studies social networks don’t have to stop with historical figures, though. No matter what time period you’re studying, students can be assigned to act as countries, groups of people, or even historical events. 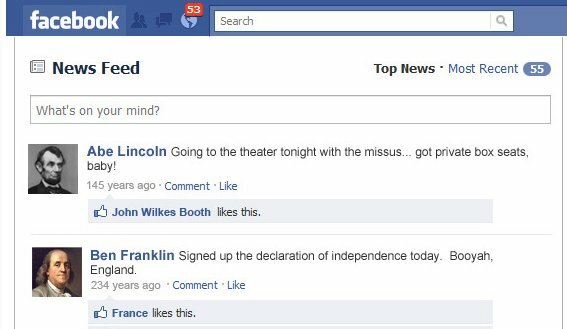 “If Historical Events Had Facebook Statuses” is a funny look at this idea (be aware, though — it was written for an adult audience). Objective: The student will be able to use speaking and listening skills to communicate fluently in the target language. On Skype in the Classroom, post a request for a partner class that natively speaks your target language. Most likely, there will be a class out there looking for English language partners, as well. Chat with the teacher to set up regular Skyping times and to assign students Skyping partners. Ideally, these sessions would be about an hour in length, with the first 30 minutes spoken in one language and the last 30 minutes in the other. For each chat, give your students specific assignments — questions about their partner’s culture, life, etc. — to guide the conversations. You might also offer students some prompts, if they have trouble keeping the conversation going for the full hour. Objective: The student will be able to analyze and describe the artistic styles associated with renowned artists. In most subjects, students are asked to do a report and give a presentation on a specific person or topic. I’ve seen art teachers have their students report on the characteristics of Jackson Pollock or Frida Kahlo’s styles. Why not have your students create a screencast to communicate this knowledge? They could pull up photographs of artwork on their computer. Then, while recording with Jing, they could explain their thinking about brush strokes and color as they annotate over specific parts of the paintings. You could then use these screencasts to help instruct future students, or post them online to help teach art students around the world. Objective: The student will be able to create an object to solve a problem or answer a question. Once students have a strong grasp on circuits and how they work, thousands of tinkering opportunities open up. Students can use motors, switches, and batteries to create complex robots and machines. Have your students discuss school-wide problems they think they can resolve. For example, maybe they’ll notice that the window where they turn in their lunch trays is always backed up and piled high with dirty lunch trays. Then, have students work independently or in groups to design and build something to solve this problem. Maybe they’ll create something good enough to solve the problem. Maybe they won’t. Either way, the objective has been acheived — in tinkering, it’s process over product. Objective: The student will be able to organize and track all the pieces of a long-term project. I work with a lot of middle and high school teachers who utilize Project-Based Learning in their classrooms. There’s a great benefit to PBL — students are engaged, motivated and learn a ton of content. On top of that, though, students also learn important soft skills, like working in a group and time management. Timelines can be a great help when it comes to those soft skills. Students can use programs like Capzles to plan out their projects — what date they’ll finish their abstract, when they’ll complete their research, etc. As students complete various tasks, they can upload the finished product directly to the timeline (or add a link to their work). Then, everything is in one place and, if it’s a group project, group members can divide the work and then access one another’s completed products.